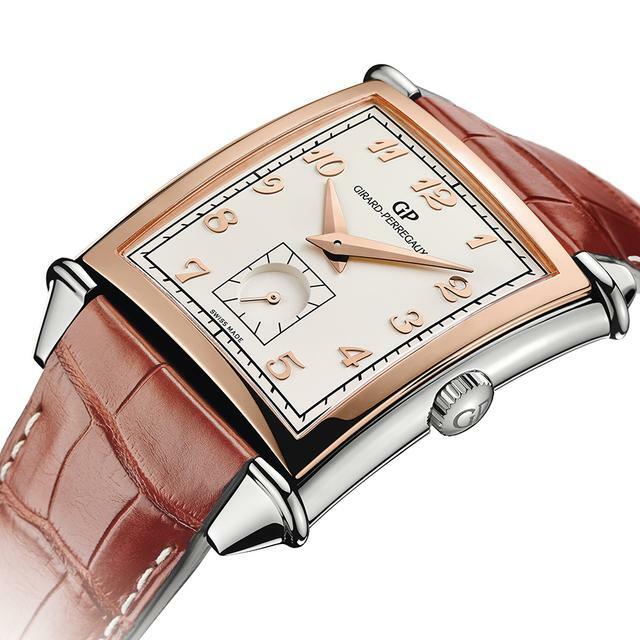 The Girard-Perregaux Vintage 1945 timepiece celebrates its 70th anniversary in 2015, and this year at Baselworld Girard-Perregaux is celebrating by reinterpreting the Art Deco lines of its iconic collection with two limited-edition models that pay tribute to the original model. One of the tribute watches, the Vintage 1945 Small Seconds, reinterprets the personality of the original model with a two-toned pink gold and steel case, applied numerals on its dial and dauphine-shaped minute and hour hands. The hours are marked as on the original model by Arabic numerals. The applied numerals take the pink gold color of the bezel while the small seconds indication retains the symmetry of the original design. On its rectangular gold and steel case (with pink gold bezel) Girard-Perregaux integrates the crown as on the original model, and on the caseback is the engraving of the limited edition and commemorative logo of the anniversary. 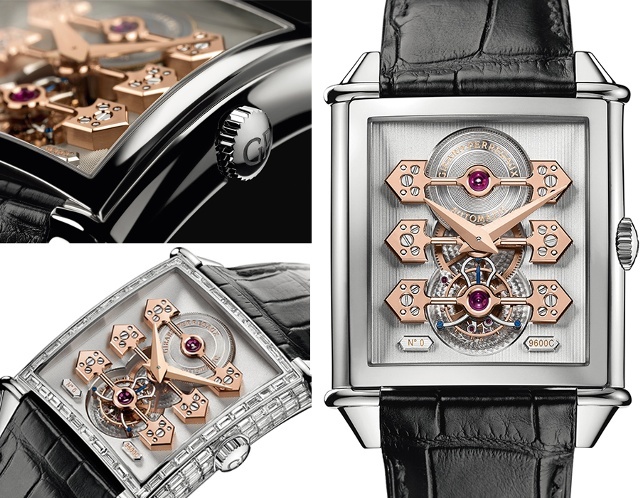 The second Vintage 1945 anniversary model is the Tourbillon with Three Golden Bridges, offered in a white gold case (eighteen examples) and in the same case with a diamond bezel (eight examples). This model is pure Girard-Perregaux, perhaps the firm’s best-known design and one that the firm has been re-interpreting since its first design won a gold medal at the Paris Universal Exhibition in 1889. An automatic Girard-Perregaux movement powers the anniversary example with a platinum micro-rotor positioned under the barrel. Not all the 2015 debuts here are Vintage 1945 models. 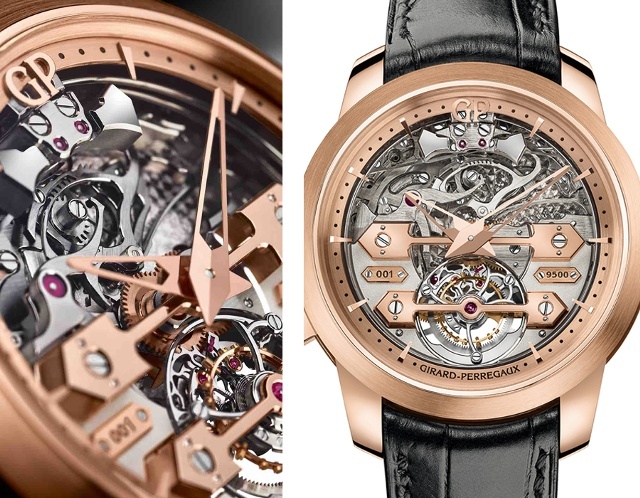 Girard-Perregaux this year places the golden bridge motif into a stunning Tourbillon Minute Repeater with Gold Bridges, a 45mm round skeletonized model that displays on its front side not only a Tourbillon with Gold Bridges, but also the majority of the components that enable the minute repeater to produce a clear sound, even when in position on the wrist. With this watch, the owner can simultaneously observe on the dial side the components of the striking-mechanism and the repeater’s hammers as they strike the wires of the gongs. In addition, the inside of the case has been crafted and finished to limit acoustic interference. This watch is a limited edition of ten pieces. Girard-Perregaux’s dressy 1966 also appears this year with artisanal dials on three debuts the firm calls the Chamber of Wonders. 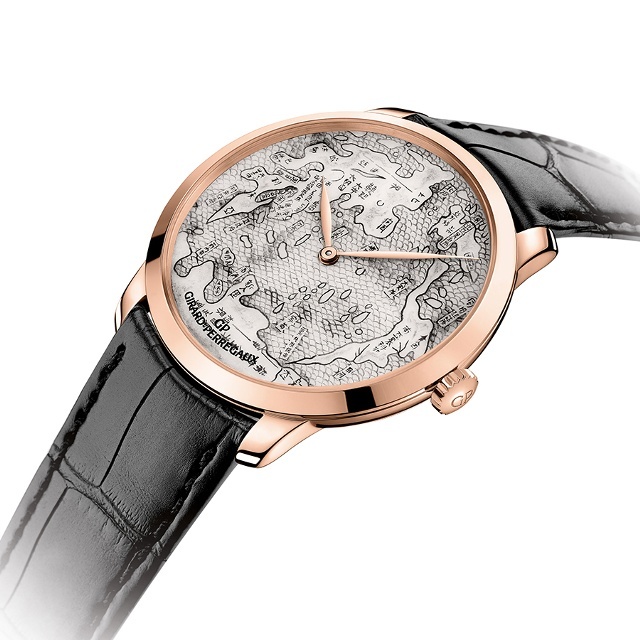 With this collection, Renaissance images are immortalized by Girard-Perregaux on three dials, called The Pearl of Wonders, the Terrestrial Map, and The New World, each in numbered pieces within a trio of pink gold Girard-Perregaux 1966 watches fitted with an automatic manufacture caliber.